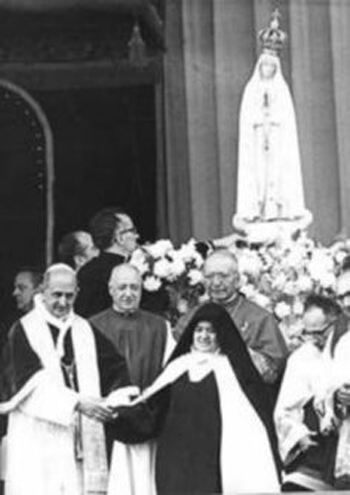 It was the 50th anniversary of Fatima on May 13, 1967, when a smiling, very happy looking Sister Lucy was pictured with Paul VI on the stage of Fatima. Most of the crowd was thrilled at the sight. Others were horrified. Why was Sister Lucy so relaxed and supportive of the leader of the “wicked Council,” which most likely contributed to the loss of millions of souls? She seemed to have set aside her previous distress about how the faithful had been lied to and abandoned by their leaders. It was hard to imagine Sister Lucy being a defector of the Blessed Mother as Judas betrayed Our Lord. Her actions, then, actually turned some Catholics away from Fatima. Decades later Dr. Marian Horvat wrote the article The Two Sister Lucys - Photos and Facts comparing pictures and mannerisms of the two Sister Lucys and demonstrating that the Sister Lucy pictured with Paul VI was an imposter. In 2013 a forensic progression and regression of photos of both the real Sister Lucy and the imposter further confirmed that there were two Sister Lucys. Most fervent supporters of Fatima do not believe the two Sister Lucys theory described by Dr. Horvat in her article because they fail to realize that the Novus Ordo Church is the real enemy of Fatima and the faithful. There is an abundance of proof that there are two Sister Lucys. The photo comparisons are overwhelming and her actions with Paul VI at Fatima were troublesome. There is much more evidence when we compare the words of Sister Lucy with those of the progressivists. Starting in 1958 after Fr. Fuentes interview was made public, the progressivists, who despised the Catholic Faith, controlled the messages of Fatima. Nothing was made public unless it supported their agenda, which is to destroy the Catholic Faith. One example was the 1973 book titled, A Little Treatise on the Nature and Recitation of the Rosary. 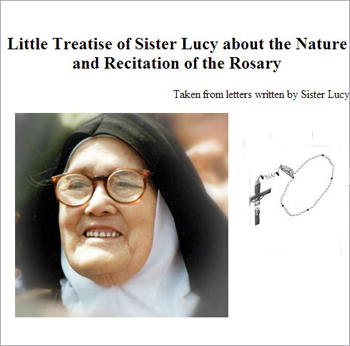 The book contained excerpts from letters Sister Lucy wrote defending the Rosary, which was under attack in the Novus Ordo Church. In it she introduced the expression “diabolical disorientation” to describe the fact that the Devil was able to infiltrate evil under the guise of good and acknowledged the failure of the religious leaders to uphold their responsibilities. Here we see the progressivists taking advantage of an old political strategy – “You never want a crisis to go to waste” – using the words of one whom the world thought to be Sister Lucy to cleverly change her thoughts and mission about Fatima. One letter starts: “I answer your letter on the anniversary of the Holy Father’s ordination.” Everything in this book favors His Holiness with no hint of criticism or warnings. There was not a word about the Pope disobeying the Mother of God, not releasing the Third Secret or consecrating Russia to her Immaculate Heart. 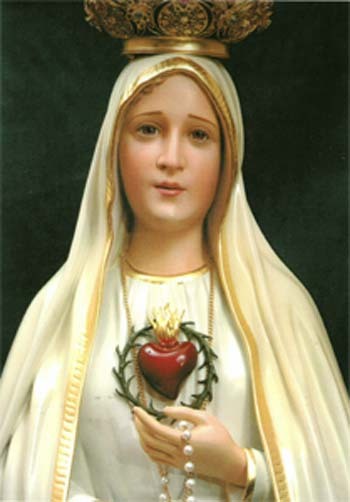 How could this person be the Sister Lucy who had been shown at Tuy on June 13, 1929, Our Lady of Fatima with her Immaculate Heart in her left hand without sword or roses, but with a crown of thorns and flames because of the sins of the world? Would the real Sister Lucy have forgotten this? Strong words from Sister Lucy. What happened between 1957 and 1973 that changed her mind? Had there been a great conversion inside the Church? Not at all; quite the opposite. No one could deny that the crisis of Faith, Morals and consequently the crisis of vocations had grown freely and vastly. We know that John XXIII read the Third Secret in August of 1959 and Paul VI in late June 1963. Yet both disobeyed the wishes of Our Lady and did not release its contents. One is left to wonder: Why did Sister Lucy downplay the importance of Marian devotions? Why would she follow the example of the post-Conciliar Church and Popes who wanted to downplay Our Lady to placate the Protestants in their ecumenical encounters instead of following the instructions of Our Lady? 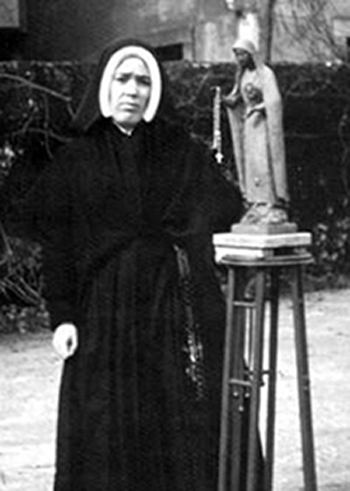 Her mission was to establish devotion to the Immaculate Heart - why the silence? Lucy was chosen by Jesus Christ to establish devotion to the Immaculate Heart of Mary throughout the world. Would the real Sister Lucy say she believes it is her duty to remain quiet? Especially when the Church authorities were doing so little to promote this special devotion? Was there anything else in her mission? There is an answer, there is a solution. Surely the real Sister Lucy, faithful to her mission, would have been stressing the importance of the devotion to the Immaculate Heart of Mary and taken every opportunity to make it known. In another letter to Dona Maria, Sister Lucy did a beautiful job explaining the prayers in the Rosary; the Our Father, Hail Mary and Glory. She made no mention, however, of the Fatima prayer given to Sister Lucy by Our Lady of Fatima. Having received this order and the guarantee she would go to Heaven, how can we imagine Sister Lucy would ignore this prayer and effectively disobey Our Lady of Fatima? Sister Lucy’s mission was to warn us about the eternal fires of Hell and provide us with a solution. Both were defied and hidden by the Novus Ordo Church. The bogus Sister Lucy also returned inquiries about the crisis regarding the Rosary from three of her nephews who were priests and others. Instead of encouraging its daily recitation, she emphasized that diabolical disorientation was taking over the Church and the world. In his book Fatima in Twilight, Mark Fellows affirms that Sister Lucy was correct in her assessment of a diabolical disorientation in the Church and many agreed with her. One was Paul VI. As Mark Fellows points out in his book, Paul VI did not use the exact words diabolical disorientation, but he did use the words “confusion, apostasy and crisis in faith,” which corresponds to Lucy’s description of diabolical disorientation. Diabolical disorientation is associated with Sister Lucy even today. These words helped enable the bogus Sister Lucy to remain undiscovered. In principle it is very good to alert people about a diabolical disorientation. However, it becomes suspicious when this alert is given to deviate attention from much more important things, to wit: the secret message Our Lady told the Pope to reveal in 1960, the consecration of Russia and the spread of the devotion to the Immaculate Heart of Mary. So, we cannot exclude the idea that this warning was an initiative to divert attention of the faithful from the nucleus of the Fatima message. Who Is For or Against Our Lady of Fatima?